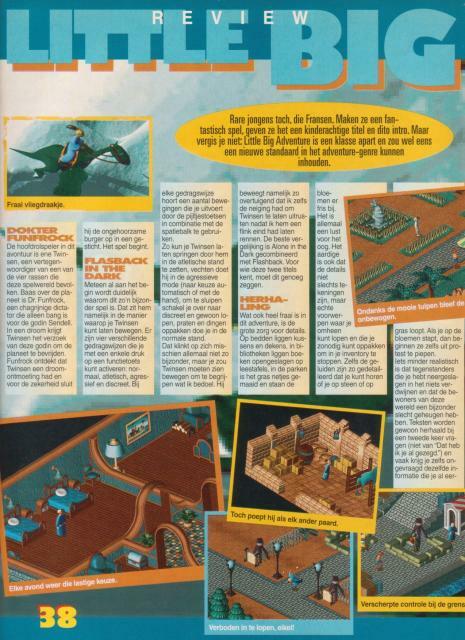 First part of the LBA1 review in the Dutch gaming magazine Power Unlimited. The English translation follows. Weird guys, those French people. They make a great game but give it a childish name and intro. But don’t be mistaken: Little Big Adventure is really something and it could mean a new standard in adventure games. The main character in this adventure is a person called Twinsen, he belongs to one of the four races that live on this game world. The boss of the planet is Dr. Funfrock, a grouchy dictator who is only afraid of the goddess Sendell. In a dream Twinsen gets a request from this goddess to free the planet. Funfrock discovers Twinsen had this dream and to be sure he locks the disobedient civilian in a sanitarium. The game starts. Right from the start you can see why this game is so amazing. It’s in the way you move Twinsen. There are four kinds of behaviours which you can activate by a single press on a button: normal, athletic, aggressive and discreet. With every behaviour belongs a couple of moves you can do by using the arrow keys in combination with the spacebar. This way you can make Twinsen jump by putting him in athletic mode, he can fight in the aggressive mode (you can choose between automatic or manual), to sneak you switch to discreet and you can just walk, talk and pick things up in normal mode. That may not sound very spectacular, but you would have to see Twinsen move to understand what I mean. He moves so real that I nearly made Twinsen rest after I had made him run for a while. The best comparison you can make is with Alone in the Dark combined with Flashback. Those who know these two knows should know enough. Another thing which is great about this adventure is the great care of detail. There are pillows and blankets on the beds, there are books in libraries opened on tables, in the parks the grass has been mowed, and the flowers look fresh. It’s all great eye candy. It’s also great that the details aren’t just drawings but real objects on which you can walk or which you can pick up to put in your inventory. Even the sounds are so detailed you can hear whether you are walking on stones or on grass. When you walk on the flowers they even start to make noise out of protest. Something which is not very realistic is that opponents who you have knocked down just disappear and that the civilians of this world have a very bad memory. Texts are just being repeated when you ask something again (they don’t say things like: “I already told you that”) and often you even get the same information you got before without asking. After beating up an innocent person you can just walk out of the room and get back in. It will be like nothing happened, the victim talks again and even objects you picked up are back so you can pick them up again. This last thing is probably a mistake of the creators, even though it is very helpful. You can always get maximum money, energy and magic by just walking in and out of the same room.